A United Launch Alliance Atlas 5 rocket carrying the third Advanced Extremely High Frequency (AEHF-3) satellite for the United States Air Force lifts off from Cape Canaveral Air Force Station on Sept. 18, 2013. The AEHF constellation will provide survivable, global, secure, protected and jam-resistant communications for high-priority military ground, sea and air assets. WASHINGTON — The third in a series of highly secure U.S. military communications satellites successfully launched in the early morning hours of Sept. 18 aboard a United Launch Alliance (ULA) Atlas 5 rocket from Cape Canaveral Air Force Station, Fla. The rocket launched at 4:10 a.m. local time and the Advanced Extremely High Frequency (AEHF)-3 satellite separated from the vehicle about 51 minutes later. AEHF-3 faces 110 days of orbit-raising operations and 60 days of testing, according to a U.S. Air Force press release. “AEHF is functioning well in tests, and allies are connecting to the system for the first time. It shows that our product is meeting mission needs, and we have room to expand capacity for both tactical and strategic users in the future,” Mark Calassa, vice president of protected communication systems at Lockheed Martin, said in a statement. Northrop Grumman Aerospace Systems of Redondo Beach, Calif., provides the satellites’ communications payloads. “The sophistication of this payload will provide users with literally millions of options for countering various enemy electronic, cyber and physical threats,” said Stuart Linsky, vice president of communication programs for Northrop Grumman Aerospace Systems. The first satellite in the constellation, AEHF-1, was launched in August 2010 but took more than a year to reach its operational orbit due to a propulsion glitch. AEHF-2 joined AEHF-1 in orbit in May 2012. The satellites are designed to provide assured and highly secure communications links under all conditions, including a nuclear war. One AEHF satellite provides more capacity than the entire legacy Milstar constellation. Currently, the satellites are used by Canada and the Netherlands in addition to the United States. The fourth AEHF satellite is expected to launch in 2016 or 2017, Air Force officials have said. Satellites four, five and six are on schedule, according to a Sept. 18 press release from Lockheed Martin. The Atlas 5 configuration used in the launch featured a 5-meter payload fairing supplied by Ruag Space of Europe and three solid-fueled strap-on boosters provided by Aerojet Rocketdyne of Sacramento, Calif. 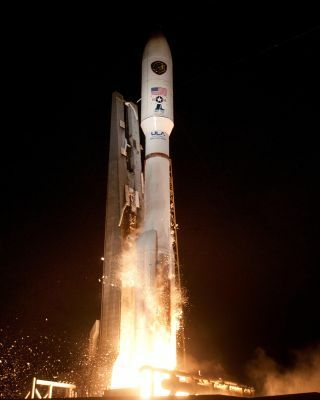 The Atlas 5, one of two rockets built by Denver-based ULA, is used primarily for U.S. government missions but launches the occasional commercial satellite. “Today’s successful launch was the 75th since ULA was formed nearly seven years ago, the 40th Atlas 5 mission, and the fourth ULA launch in the last six months,” Jim Sponnick, ULA vice president of Atlas and Delta programs, said in a prepared statement. ULA is a Boeing-Lockheed Martin joint venture.